What is a dog barking whistle and how do they work? Will a dog bark whistle actually stop a dog barking? What alternatives are there to whistles for bark deterrence? 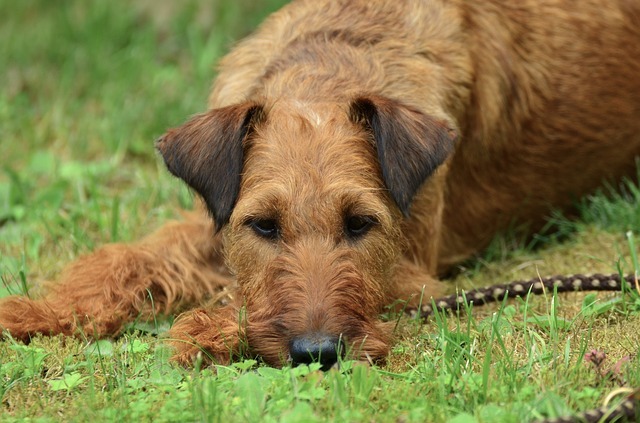 Does Whistling Hurt Dogs Ears? Do Cats Hear Dog Whistles? 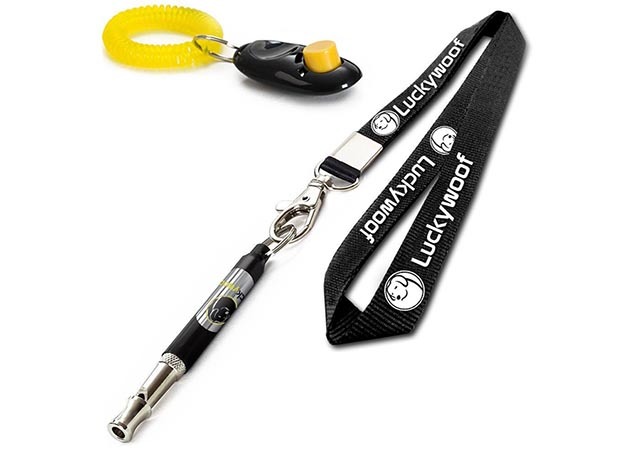 A dog barking deterrent whistle is a very low cost option for trying to control a dog’s excessive barking. For many people, they are often the first thing to try particularly on a neighbor’s barking dog, when a bark control collar isn’t an option (these are a great choice when the barking dog is your own pet). A dog bark whistle can still certainly be used on your own dog, along with behavioral modification training. So whether it’s your own pet or one living near you that just won’t give you any peace, a whistle is an option to consider. But how do they work, and do they even work? If so, what’s a good whistle to buy so you can immediately start using it to see if it lessens the stress of the barking dog near you? 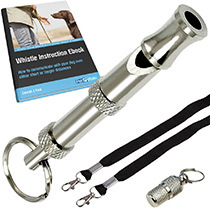 This guide provides an overview of the best dog whistles to help stop barking, and for dog training, and also explains how they work. I detail the top products which I’ve researched to save you the time. 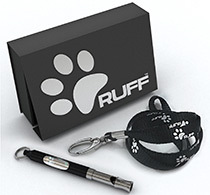 These are very inexpensive tools which are easy and convenient to use for almost any dog owner. Compared to other types of training aids, the cost of a dog whistle is small. A dog whistle to control and stop barking uses ultrasonic sound – which is above the range of normal human hearing. Dogs and cats are two of the many animals that can hear sounds in the ultrasonic range (so keep this in mind if you have a cat as well). These whistles will not harm a dog when used properly. Never use an ultrasonic whistle in close range to any dog, other animal or human. Their goal is to make an alarming sound that the animal can not ignore. This is intended to suddenly interrupt the barking and distract the dog from whatever he/she was barking at. If used in training, you can then follow up with a training command or positive reinforcement techniques. Most ideal for self protection. 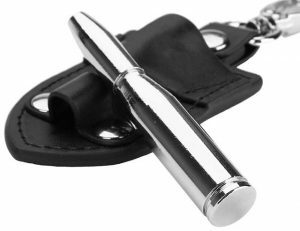 A new whistle that has my attention is one I just came across recently, yet I don’t know how I missed it because it’s a really popular one. The Fox 40 Sonik Blast. With a name like that, it sounds crazy powerful – but this is a real tiny whistle that looks not much different than your weekend soccer referee would be holding. Keep in mind that this whistle is made for emergency type situations – it’s not designed as a training tool for dogs. Why am I talking about it here then? The Fox 40 Sonik Blast is used by many people as a portable, easy to carry deterrent that can be quickly taken out in the case of being approached by an aggressive or potentially aggressive dog when out and about. The great thing about using ultrasonic technology to help control a dog’s barking is that you won’t be bothering anyone. If it’s your neighbor’s dog who won’t stop barking, and you’ve tried to fix the problem with no success, using an anti-bark whistle can be done without your neighbor even knowing. Some whistles come with an additional clicker device. These are a training package and are a good choice if you’re serious about wanting to train your dog to stop barking, and not just stop it on a one off basis every time he barks inappropriately. I’ve chosen to list just a few whistles here because, quite simply, most of them are very much the same. Ultrasonic whistles are simple devices with few features to mention. This is good news as it is reflected in the low cost of these products. Whichever one you choose to use, your efforts will be particularly rewarded if you can combine using the whistle with reward training (where it’s an option; obviously not if the dog is not your own). I’ve chosen two of the best whistles for dogs to feature in more detail here. You will notice that some of the above products look very similar to each other and function the same as well (with a difference being some useful bonus items which are worth considering when choosing one to purchase). This is simply because the whistle is a basic design which works – subtle features as well as bonus items differ between products though. Below I’ve outlined the main benefits and features of each brand, and the added items that come in each package which can provide additional help with using the ultrasonic whistle, as well as assistance for more general training for bark control and dog behavior. 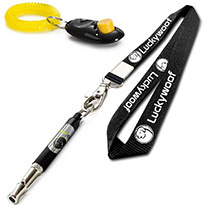 This ultrasonic dog whistle is small and easy to carry around with the supplied lanyard. Like all good dog whistles, when you blow it the sound will be hardly heard by humans but will be loud and clear to any dogs (and cats) who are within range. Unlike some of the simpler whistles out there, the PetCore lets you adjust the sound pitch so you can set it to get the best reaction. Every dog breed and individual has a slightly different ear, so even small adjustments in frequency can make a big difference in how they hear it. Once you’ve got the right setting for your dog, you can lock it in and not have to worry about it again. A nice bonus is the funky waste bag dispenser (that’s the blue bone shaped item) that attaches to the dog’s leash and lets you easily access a waste bag when you’re out walking. This whistle comes with a money back guarantee, so there’s nothing to lose by trying it. This whistle works almost identically to the PetCore above. The main difference in the products are the bonus items you receive, and these will likely determine which one you choose to buy. All of these whistles allow you to adjust the frequency sound. This means that if a dog doesn’t react, you can slightly change the pitch of the sound with a minor adjustment, and it can make all the difference in getting a reaction from the dog. Just like people, dogs are individuals and each dog’s ears are going to pick up slight differences in frequency. Being able to adjust this on this whistle means you can find the sweet spot, and leave the whistle set in the right position for future use on that particular dog. 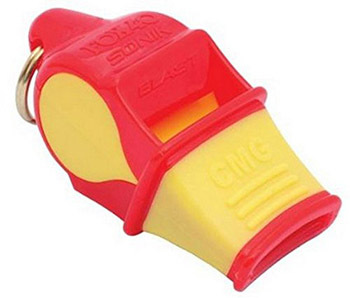 Whistles are just one type of ultrasonic device that are used for dog training and excessive barking deterrence. Other ultrasonic bark training and control devices include handheld units, and outdoor devices that can be used for neighborhood barking issues. There is no guarantee and is just one method to try. It has worked for many people, while others need to work with other barking control strategies. What you choose to do depends on whether you’re trying to work with your own dog, or neighborhood barking where you don’t have control over the dog. If you think you need something more advanced than an ultrasonic whistle to deter a barking dog, there are certainly many other options to consider like ultrasonic devices, collars (for your own dog), and strategies to help stop a neighbor’s dog from barking. There’s a big difference between a whistle that a human can manage on their own, and a whistle that you can emit from a device like the ones I’ve outlined in this guide. Unless you’re the Guinness World Record holder for the highest pitched whistle (5274 Hz) or the loudest whistle (125db), then your whistle is probably at a pretty average pitch and volume as most people can’t get anywhere near those world record whistles! The Fox 40 Sonik Blast whistle, for example, is rated at 120db in volume, just under the loudest recorded human whistler in the world. And when it comes to frequency or pitch, a very in depth scientific study using complex mathematics determined that the average human whistles within the frequency range of 500-5000 Hz. Keep in mind that ultrasonic sound is measured at 20,000 Hz and above – way above any human whistler and beyond our hearing capabilities. Dogs have naturally highly sensitive hearing, and of course can hear in a much higher frequency range than us mere humans. When it comes to volume though, there is surprisingly little knowledge about the potential effects of volume on a dog’s hearing over the long term (or even the short term). For example, we know that human hearing is severely effected by repeated exposure to loud noises, with tinnitus being an obvious and common complaint. We know dogs can go deaf (caused by a range of reasons), but measuring whether they suffer from tinnitus is not quite as simple as it is in people – we can’t ask a dog if his ears are ringing! One study is focusing on hunting dogs who are exposed to the frequent loud sounds of gunfire. The study found that some dogs who are regularly exposed to gunshots at close range (standing next to their owner, for example), showed some hearing loss and scientists noted “extreme differences” in hearing decline between the studied groups of hunting and non-hunting dogs. What does this mean for whistles though? A gunshot can range in the 140-190 dB volume level, making it one of the loudest sounds. Coupled with the fact that hunting dogs are repeatedly exposed to the sounds over periods of many years puts them at much greater risk of hearing loss. A whistle on the other hand is both lower in volume and used infrequently, therefore is extremely unlikely to ever cause hearing damage to a dog. It goes without saying however, that no type of whistle should ever be blown close to or in a dog’s ear – use common sense. If you don’t want it near your ears, neither does a dog. A properly and responsibly used whistle is safe for dogs, which is why they’re a choice for many dog trainers. If you also have a cat and you’re thinking about using a dog whistle at home, either for your own dog or to attempt to disrupt a neighbor’s barking dog, then sparing a thought for how this might affect your cat(s) is only natural when you care about your animals. So can a cat hear a whistle that’s designed for dogs? Specifically we are talking about ultrasonic whistles here, or silent whistles as they’re often called (because they are silent to humans at least). This doesn’t include training whistles that work in regular human-ear-frequency range, which are easily heard by both cats and dogs. So the real question is: can cats hear in the ultrasonic range like dogs can, and if so, how would a dog whistle of this type affect a cat? We all know how superbly sensitive a dog’s hearing is, but you might be surprised to know that cats can hear to an even higher frequency than dogs! Studies on cats have found that they have one of the broadest hearing ranges amongst mammals and are able to hear sounds between the range of 48 Hz to 85,000 Hz. Compare this to dogs who have a known hearing range of 67 to 45,000 Hz. These are of course typical measurements and each individual animal will have their own specific hearing ability based on their health status and age – however these numbers are a safe guide to use. So what does this tell us? It’s clear that cats have even more acute hearing than dogs, and they’ve managed to evolve the ability to hear at an even higher frequency without sacrificing their ability to hear at a lower pitch than dogs – giving cats a wider spectrum of hearing ability. In practical terms this means cats will certainly hear any ultrasonic device that’s designed for dogs if they are within range of it. While it won’t hurt a cat, these ultrasonic device should not be used if you have small rodent pets like guinea pigs or rats, hamsters, chinchillas or gerbils etc.